Recently, Hasbro has sought to replace an old game token for a new one for its family game night staple, MONOPOLY. Somehow the company overlooked one of the most important parts of this cherished tradition: the All-American fun-time, family-friendly staple- the popcorn bowl. Since 1935 MONOPOLY and delicious buttery popcorn have gone hand-in-hand at countless family game nights. JOLLY TIME Pop Corn is leading the charge to petition a reconsideration from by Hasbro, and include a popcorn game piece in the running for the newest token. The new token will not be chosen until Feb. 5 and JOLLY TIME CEO, Garry Smith believes there is still time. He has written a letter to President and CEP of Hasbro asking for reconsideration. The fifth-generation popcorn company is also collecting petition signatures through its Facebook page at http://www.facebook.com/JollyTimePopCorn/app_297084673727680. As big time popcorn and Monopoly fans here at annaDishes we think this is a great idea! Whether it is at the movies, or at home on the coffee table, popcorn is synonymous with good times! Why not be a part of history and help get popcorn on the Monopoly Board?! See below to enter for a chance to win this super popcorn pack of goodies! The American Pop Corn Company of Sioux City, Iowa, is an independent and family-owned company that, for nearly 100 years, has produced and marketed JOLLY TIME Pop Corn, the first branded popcorn ever produced. JOLLY TIME offers a variety of traditional and microwave popcorn products in grocery stores nationwide and has the only microwave popcorn endorsed by Weight Watchers. 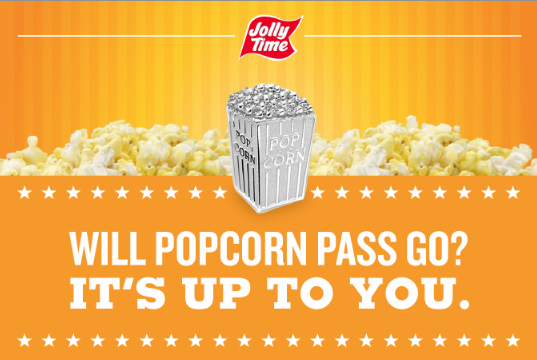 JOLLY TIME Pop Corn is completely gluten free and is produced using GMO-free popcorn. Learn more at www.jollytime.com.